As the NFL schedule transitions into the second quarter of the season (sure the Tampa Bay Buccaneers and New England Patriots have kicked off Week 5), there have been several key performances across the league on the interior of the defensive line. Namely a return from injury, and return to form from J.J. Watt, entering Week 5’s full slate, interior defenders are the only position group to field four players with Elite or higher grades (90.0-plus). PFF Elite Stat: Buckner’s 23 total pressures is most among interior defenders, and third most among any defensive player. Buckner has the second-highest pass-rush grade among defensive interior players at 90.6, and the fourth-highest run defense grade while no other interior defender sees a grade of each in the top five. Buckner has racked up 23 pressures and 10 stops in run defense, both good enough for first and T-fourth, respectively. 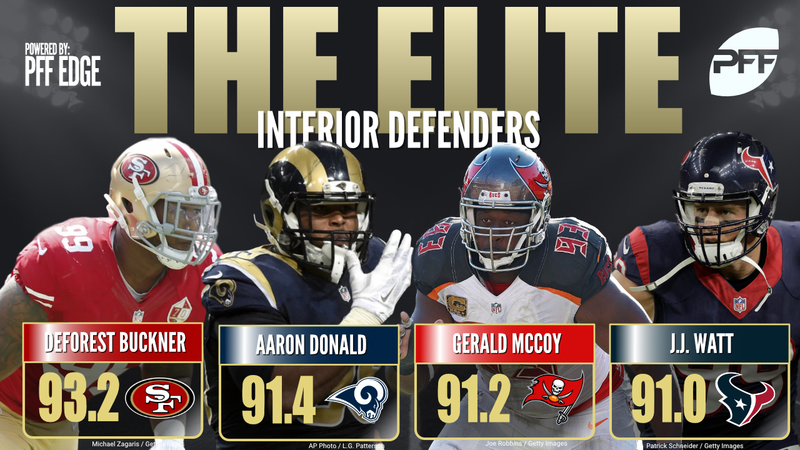 PFF Elite Stat: Donald’s 12.6 pass-rush productivity is eighth among interior defenders. Donald has one game less than others interior defenders, yet, has the fifth among the group with his 16 total pressures in just three games. He has five total stops this season and multiple QB pressures in every game he’s played in. PFF Elite Stat: 18 QB pressures through just four games ranks McCoy fourth out of all defensive interior players. McCoy is almost halfway to his total run stops from a season ago (18) with his seven stops in run defense in four games. More impressively are his 18 total QB pressures through four games, which are good enough for fourth among interior defenders. PFF Elite Stat: 10.0 pass-rush productivity mark ranks eighth among 3-4 defensive ends. While he hasn’t gotten on the stat-sheet with a sack yet, Watt has been returned to form after an injury-shortened 2016 campaign racking up 15 total QB pressures, which rank him fifth among all interior defenders. PFF Elite Stat: All seven of Suh’s pressures have been hurries. Suh has been relatively quiet in terms of numbers on a box score, but his impact has been felt across the board, as his 92.3 run defense grade is the highest among all interior defenders, and second-highest among all defensive front seven players. PFF Elite Stat: 13.2 pass-rush productivity grade ranks sixth among interior defenders. Atkins has 19 total QB pressures on the season, including seven that have resulted in a hit on the opposing quarterback (three sacks, four hits). He’s racking up the pressures at a high rate, as depicted by his 13.2 pass-rush productivity, which ranks fourth among defensive tackles. PFF Elite Stat: 13 stops in run defense is more than any other interior defender. Joseph has been an absolute menace to opposing offensive running games. He’s accumulated 17 total tackles (15 solo), and 13 of which have resulted in a ‘win’ for the defense, also known as a stop. His ridiculous 18.3 stop percentage is also the highest among all interior defenders. PFF Elite Stat: Brockers’ 13.2 run stop percentage is seventh among defensive tackles. The Rams formidable one-two punch on the defensive interior of Brockers and Donald has paid dividends for an upstart-Los Angeles so far this season. Brockers has 10 stops in run defense, as well as 10 QB pressures, ranking him tied for third, and eighth, respectively, among defensive tackles. PFF Elite Stat: Seven stops in run defense ranks him tied for 10th among defensive tackles. Not known necessarily for his pass-rushing, Damon ‘Snacks’ Harrison has pulled in seven stops in run defense for a 7.9 run stop percentage. And while the numbers don’t look to gaudy, he has been a force for opponent’s offensive lines to deal with, and his 90.3 run defense grade (third among DIs) is evident of that. PFF Elite Stat: Jernigan’s eight total QB pressures are good enough for a tie for 15th among defensive tackles. Jernigan has found a nice home on the front end of the Eagles front seven, grading positively in every facet, in every game this season to date. In doing so, Jernigan currently holds the league’s ninth-highest run defense grade and 16th-highest pass-rush grade among all interior defenders.